We have expanded our Aarikka range and there are now even more fabulous jewellery, gifts and home decoration items to choose from and buy online. From must-have earrings and necklaces to funky towel clips and festive Santa's elves, there is plenty to discover. To find out more about the new arrivals, keep reading, or if you can't wait that long, click to buy new Aarikka products now. 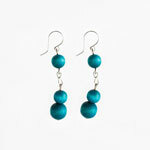 Make a statement with these bright turquoise bead earrings. 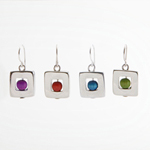 Mesi earrings measure 45mm long and have silver hooks. Available now from Arctic Fashion for under £20 a set. An ideal gift for your daughter, granddaughter, little sister or neice, the Soma jewellery set comes in this season's colour - purple. 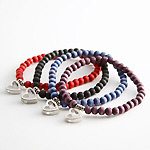 It includes a 38cm bead necklace with heart pendant and matching bracelet. A chunky purple bead bracelet in the colour for autumn/winter 2009. The Etydi bracelet will make a funky addition to your winter wardrobe. Same design, new colours. 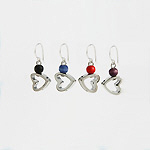 You can now buy Romance earrings in blue and purple as well as red and black. The original popular design is now available in purple and blue. Foxi earrings - new colour! Be a la mode this season and get these eye-catching earrings in purple. If purple's not your colour, they are still available in red, jeans blue and apple green. Hurry, while stocks last. 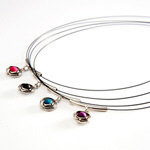 Aarikka's popular Jive necklace design now comes in anilin red and turquoise blue. Don't forget to team it up with a set of matching earrings! 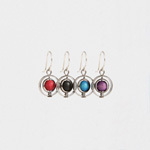 Brighten up the autumn/winter months with Jive earrings in red, turquoise blue or lilac. Whether you want to add a splash of colour to your kitchen, bathroom or bedroom this winter, Kukka towel clips are a quick and fun way to achieve this and they serve a practical purpose. Choose from yellow/orange or mixed green. 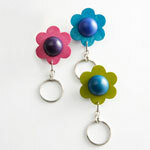 This bright, flower-shaped keyring is a colourful reminder of spring and summer. 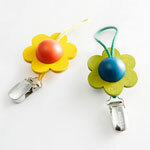 Put a smile on someone's face - the Kukka keyring makes a lovely, eco-friendly stocking filler. Available to buy now in mixed red, mixed green and mixed blue. 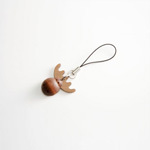 Add a touch of Finnish charm (literally) to your mobile with this cute moose-shaped mobile charm. 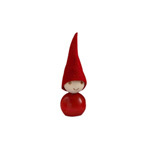 Made from sustainable wood from Scandinavia, this 2 gram charm won't weigh you down. With Christmas approaching, it's time to start thinking about Christmas gifts and decorations. Arctic Fashion can help - we have a delightful range of Santa's elves (tonttus) from Santa's homeland Finland. These fun and festive characters are all beautifully crafted from sustainable wood and are ornaments you and your family can enjoy year after year. Add Santa's elves to shelves, tabletops or mantelpieces for Yuletide charm, or, for a more personal touch, use them as individual table settings. 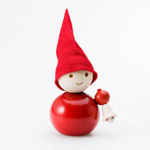 Lumitonttu is the bright red Santa's elf holding a white, carved snowflake. This delightful ornament is yours to buy for under £10. 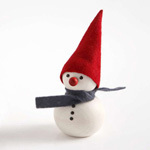 Create a frosty winter scene in your home this Christmas with Pikku Pyry. 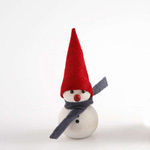 The smaller of the two snowmen ornaments measures 9cm to the tip of the hat. 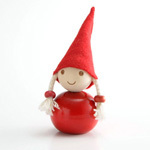 Tonttulapsi is the smallest, cutest Santa's elf in the range measuring 7cm. This design is great for creating your own eye-catching display with elves of different sizes. Available to buy now for only £5.80. A charming wooden snowman will be something you can enjoy for many Christmases to come. 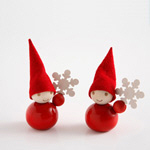 Tuisku is the larger of Aarikka's two snowman ornaments and will complement any festive display. Tonttutyttö is the pretty girl Santa's elf with plaits. Add this special ornament to your dining table as a personal place setting for your granddaughter, daughter or neice. Get into the festive spirit this Christmas with a Kellotonttu, the cheerful bell ringing elf. This design will fit perfectly on a tabletop, shelf or mantelpiece. Bring back happy memories of white Christmases past with Kelkatonttu. 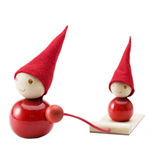 This bright, festive ornament has one Santa's elf pulling another elf on a sledge. In Finland it is traditional to give gingerbread hearts at Christmas time. 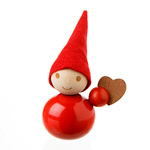 Piparitonttu is the red Santa's elf with a gingerbread heart.